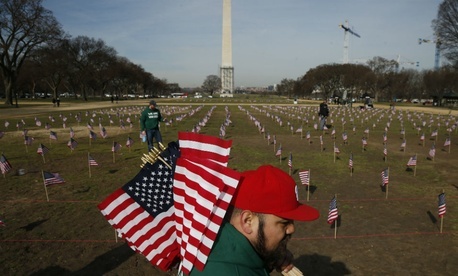 How Can Government Battle a 'Suicide Epidemic' Among Veterans? Jacob Sexton, a 21-year-old member of the National Guard, fatally shot himself inside an Indiana movie theater during a 15-day leave from Afghanistan. Democrat Sen. Joe Donnelly will unveil legislation Wednesday named after Sexton that would require service members to get an annual in-person mental-health assessment, in a push to prevent others from taking their own lives. "This is about working nonstop with Jacob's parents to prevent other families from experiencing that same pain," Donnelly said, in a video obtained by National Journal that will be released Wednesday. The Indiana Democrat's legislation, formally called the Jacob Sexton Military Suicide Prevention Act, follows the Pentagon's latest suicide numbers released late last month. The report found a decrease in the number of reported suicides among active-duty troops, but an increase in reserve and Guard members killing themselves. Meanwhile, the number of service members who kill themselves after they leave the military has increaseddramatically. The VA estimates that 22 veterans commit suicide each day, totaling approximately 8,030 veterans every year. Many service members already have an annual mental-health screening, but the Indiana Democrat's bill is aimed at closing the gaps for in-person assessments. For example, Air National Guard members currently have an annual online assessment, but face-to-face examinations are every five years. Lawmakers and service organizations worry that the stigma attached to mental-health issues keeps service members—both past and present—from asking for help or reporting mental-health problems. Attempting suicide is currently considered a crime under the military's rules. "Right now, the best and most consistent screening is happening only for those within the deployment cycle, and it leaves reservists and Guardsmen like Jacob underserved," Donnelly said. In addition to the mental-health screenings, Donnelly wants an annual report from the Pentagon to the Armed Services committees detailing the screenings and what care or follow up was recommended. The Defense Department would also have to submit a report on how to improve its response on mental-health issues. And a committee to improve mental-health services for National Guard and reserve troops would be formed with the Health and Human Services Department. Donnelly isn't alone in his search for solutions. Lawmakers have introduced a handful of proposals to address mental-health issues in the military. Some argue such measures could help prevent a shooting like the one at Fort Hood last month, when Ivan Lopez, a 34-year-old Army specialist, fatally shot three people and injured 16 others before turning the gun on himself. Donnelly and other lawmakers hope to get their proposals included in the annual defense bill, the National Defense Authorization Act. The bill has been passed for the last 52 years, and it's likely the best vehicle for avoiding partisan fighting. And Donnelly's legislation will get early bipartisan support, with Mississippi Republican Sen. Roger Wicker expected to endorse the proposal. Donnelly tried to get a scaled-back version of the legislation included in last year's defense bill. But senators stalled the bill over a fight on amendments, forcing the chairmen and ranking members from the House and Senate Armed Services committee to create a compromise bill. That meant hundreds of proposed amendments, including Donnelly's, got left out.